Want to Visit the Tairona: Kogi? ed: tours to the “lost city” la ciudad perdida (it is not lost, it is a sacred site) are not sanctioned by the Tairona:Kogi. there are also videos encouraging tours. these video invitations are also not sanctioned (see sidebar links) if you care about yourself, our world, the kogi -keepers of humanity and our environment, do not seek out the kogi, the elder brothers who are daily doing ceremony for the rest of the world – that is their job, their task, their ceremony which holds back much social and environmental devastation. If the Tairona:Kogi wish to meet you, they will send a trusted emissary. The first thing to say about meeting the Tairona is – PLEASE DON’T TRY. These people are the conscientious guardians of a tradition, philosophy and form of thought that has been pretty effectively destroyed everywhere else in the world by the advance of our own culture. 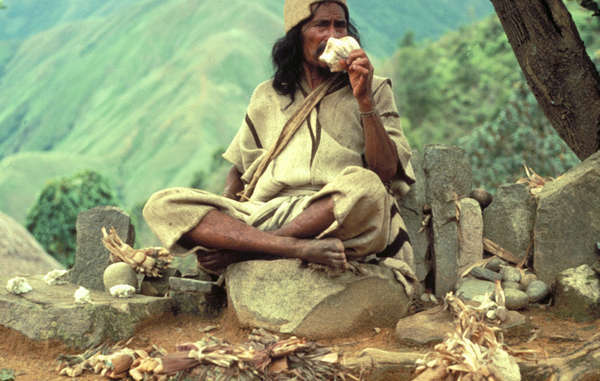 The most isolated of the Tairona communities, the Kogi, know very well that isolation is their only possibility for survival. The original European invaders of America carried death on their breath and their bodies, in the form of invisible infections which wiped out perhaps as many as nine out of every ten inhabitants of the continent. Even the best-intentioned among them were, however inadvertantly, the carriers of destruction. We also carry infections. But more than that, we carry our own way of perceiving and understanding the world, and however well-intentioned we may be, we re-form the consciousness of others. We teach more than we learn, and so we change the people we meet. That is why the Kogi demand that we stay away. For the new film, ALUNA, the Kogi themselves organised everything in the Sierra, and eventually took complete control of the filming. They also reviewed, discussed and changed the film cut. The Kogi think in terms of levels of cultural pollution; the lower down the mountain they go, the more of it they encounter. Whole areas of the Sierra are closed to whole groups of Kogi, because they have become too polluted by outside contact. The Tairona do not want to be met. But they do want to be listened to. And that is not for their sake. It is for ours. How to access Aluna the movie. extract from Jonathan. read the whole thing here. please know that they have NO interest in people coming to visit them and their sacred lands. This includes visiting La Ciudad Perdida (The Lost City), which for the Kogi was never “lost”. Rather, it was purposefully hidden, because it is an incredibly sacred site that even many Kogi are not permitted to visit… and certainly not tourists. The Kogi have gone to GREAT lengths, for the past 500+ years to keep their sacred lands free from the energy and unconscious spiritual issues of outsiders. This is something the average “Westerner” might have a hard time understanding. But all we need to understand is that the Kogi DON’T want people visiting their lands, and whether we understand the spiritual reasons for this, or not, is unimportant. Being in their territories uninvited is like walking into a complete stranger’s house, uninvited, and walking through the rooms of that house as if it were your own. It is rude and inappropriate. Please take this to HEART and KNOW what it means to violate their wish to NOT have outsiders in their sacred lands. If you feel—and KNOW within your heart—that you have a genuine calling (not just idle curiosity) to support the Kogi in some way, my only recommendation is that you take a serious and sincere interest in recovering your attention from the great many distractions—most especially “spiritual” distractions—and doing what it takes to come into greater consciousness of who you are as Spirit, where you are from as Spirit, and precisely why you are here, as Spirit. This is hard and, at times, painstaking work. Most importantly, know that the message of the Kogi is a practical one. That we day-by-day apply ourselves to the deep work of resolving our issues, misconceptions, projections, negative tendencies, etc. And that we do EVERYTHING within our power to stop living a lie (the Modern world) which is quite obviously destructive and out of alignment with LIFE. In simple terms, they are making it clear that the Western world must drastically change its ways, less we go through drastic changes. If you’re reading this, that likely includes you. The Kogi are not simply something interesting for our entertainment or idle curiosity. They do NOT wish to be idolised, for that only marginalises the deep importance of their message, which is, in reality, the Mother’s message. AND once more, they do NOT want people trying to visit their sacred lands in Columbia. Such actions are deeply inappropriate. 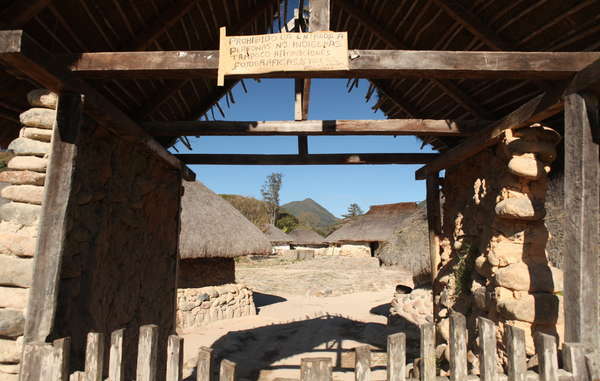 to assist the kogi and other sierra indians (Arhuaco (or Ika), Wiwa, Kogi, and Kankuamo), please go to the trust which was established in collaboration with the indians themselves . . . . Tairona Heritage Trust. The Sierra Nevada de Santa Marta is a unique pyramid-shaped mountain on the northern tip of the Andes in northern Colombia. On its slopes live four separate but related peoples: the Arhuaco (or Ika), Wiwa, Kogi, and Kankuamo. Together they number more than 30,000. The mountain’s peak is over 5,000m high. Rising from the shores of the Caribbean, the lower plains are clad in tropical forest, turning to open savannah and cloud forest higher up. To the Indians, the Sierra Nevada is the heart of the world. It is surrounded by an invisible ‘black-line’ that encompasses the sacred sites of their ancestors and demarcates their territory. Spiritual leaders are called Mamos. The Mamo is charged with maintaining the natural order of the world through songs, meditations and ritual offerings. Mamo training begins at a young age and continues for around 18 years. The young male is taken high into the mountains where he is taught to meditate on the natural and spirit world. In Western culture, the Mamo could be seen as the priest, teacher and doctor, all rolled into one. 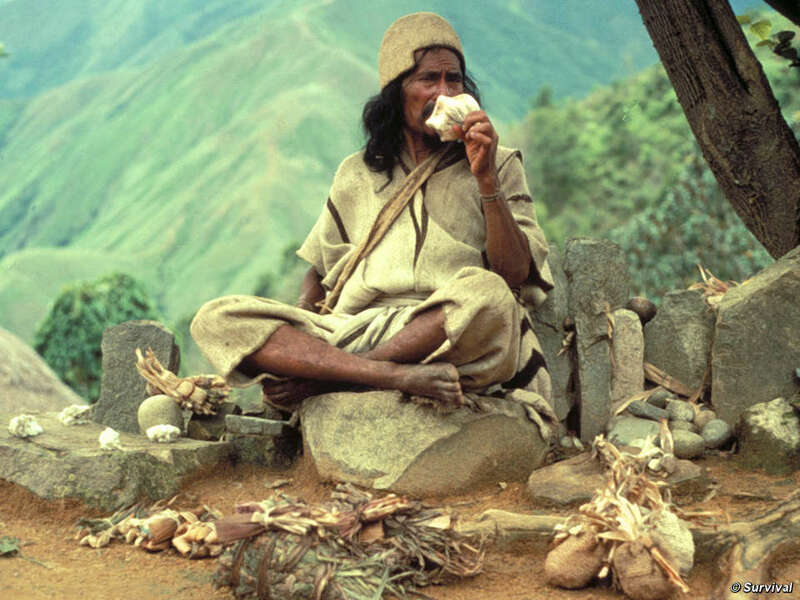 Surplus seashell powder creates a thick rim around the poporo over time © Danilo VillafañeThe coca leaf plays a central role in daily life and is used in offerings and ceremonies. Each man carries a bag of the leaves, which are chewed to create a mildly stimulating effect. When two men meet, a handful of leaves is exchanged as a sign of mutual respect. A hollowed-out gourd called a ‘poporo’ contains crushed seashells. 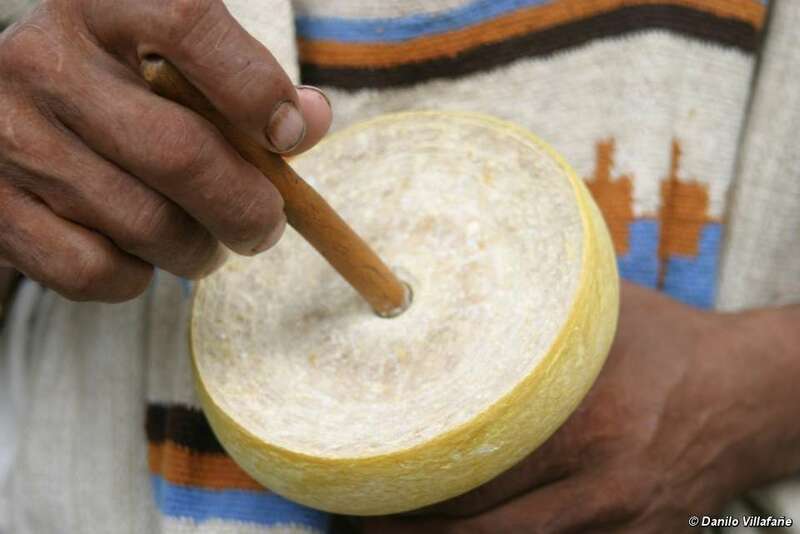 A stick is used to transfer the powder to the wad of coca in the mouth – the highly alkaline shells react with the coca to stimulate its active ingredients. Surplus powder is rubbed on the neck of the poporo – over time, this becomes a thick collar. Coca is also grown by non-Indian settlers as the raw material for cocaine. Colombia has long been dubbed the cocaine capital of the world, and its production has had devastating consequences for the indigenous population. The lower slopes of the Sierra have been occupied by colonists growing coca for the drug trade that funds much of the armed conflict between guerrilla groups and paramilitaries in the country’s long-running civil war. Despite the Indians’ peaceful nature, they have frequently been caught in the crossfire between the army and illegal armed groups, and many have been killed or forced to flee from the quasi-civil war raging on their land. The Sierra Indians are descendants of the Tairona, a great civilization whose masterful gold work and architecture draw tourists and grave robbers alike to the region. Each tribe has adapted to the invasion of their lands in its own ways: the Kogi shunned outside invasion by fleeing higher up the Sierra. They have remained particularly averse to visits from camera-toting tourists. The Arhuaco, whose men are distinguished by their white conical hats, organized a strong political movement to defend their rights, while the Kankuamo living on the lower foothills were almost entirely integrated into mainstream society. Water is highly revered by the Indians and there is strong opposition to existing and planned hydroelectric dams in the region. Dams interfere with the natural water cycle of the Sierra and threaten the tribes’ crops and livestock. Privately owned land and development projects are making it increasingly difficult for the Indians to move within their ancestral territory and make offerings to keep the world in balance. ed: the first five videos are of a series. and other videos by Jasumeen as an ambassador for the Embassy of Peace, experiencing the Kogis. the introduction to each of the videos is by Jasumeen. 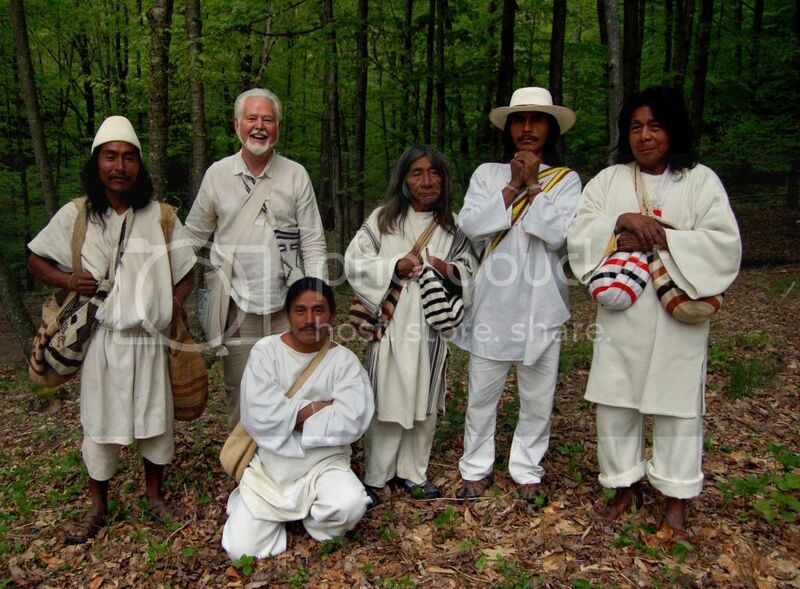 KOGI Part 1 – Meetings, Mergings & Healings – Jasmuheen with the Colombian KOGI tribe Elders. The First video in a five part series that shares insights on healing, Kogi culture & more. This video sees her initial meeting and what it triggered for her personally. Indigenous past lives and more. My healing journey with the KOGI, the inner kingdom of peace, Darkness Training & more. Jasmuheen with Colombia’s Kogi. KOGI Part 3 – The KOGI & Aluna’s Oneness. acknowledging the Elders & more. Kogi Messages continued with Jasmuheen. KOGI Part 5 – Connecting & Supporting the Kogi. Working together, being in equilibrium & harmony, how to connect with the Kogi & our indigenous via meditation on the inner plane. Jasmuheen sharing a little of her experience at the “The Dawn of a New Time” gathering. The gathering took place near Valledupar, Colombia in August of 2011. For additional information or to provide support (donations) that go directly to the Arhuaco people, contact the Tayrona Indigenous Confederation, official representatives of the Arhuaco people, at resguardoarhuaco@hotmail.com or connabusimake@hotmail.com. 4 lighten your diet: vegetarian, vegan, raw food, fruitarian, whatever suits, to no longer be involved in the slaughter of any life. Jasmuheen elaborates on the 8 point Luscious Lifestyles Program for personal harmonization – as offered by the Embassy of Peace. During the event, “The Dawn of a New Time” in 2011, over 400 people gathered from around the world to the mountains of the Sierra Nevada, Santa Marta region in Colombia. The four tribes from this region are the Arhuco, Kogis, Wiwa and Kankuamos and they welcomed all of us to their sacred spaces. Many of the visitors, the participants who specifically gathered for this event, came from countless tribes from all around the world. This cultural exchange was hosted by Arhuaco elders with their guests from the Wiwa people. After several days of ceremony, discussion and experiencing the Arhuaco way of life many participants were visibly moved and changed forever. On the 4th day, the President of the Grand Itza Maya Council of 13 Elders of the Yucatan, Pedro Pablo Chuc Cech and the Incan Sun Priest, Naupany Puma (two of the invited guests) introduced this sacred, precious and ancient ceremony. This “Sacred Solar Ceremony with the Sun-Rainbow” was intended to be inclusive of all tribes, to express deep reverence for all sentient beings, to bridge and unify the masculine and the feminine and to give homage to our sacred planet, the sun, the moon and the universe itself. This film was collaboratively created by the Foundation for Global Humanity (FGH). 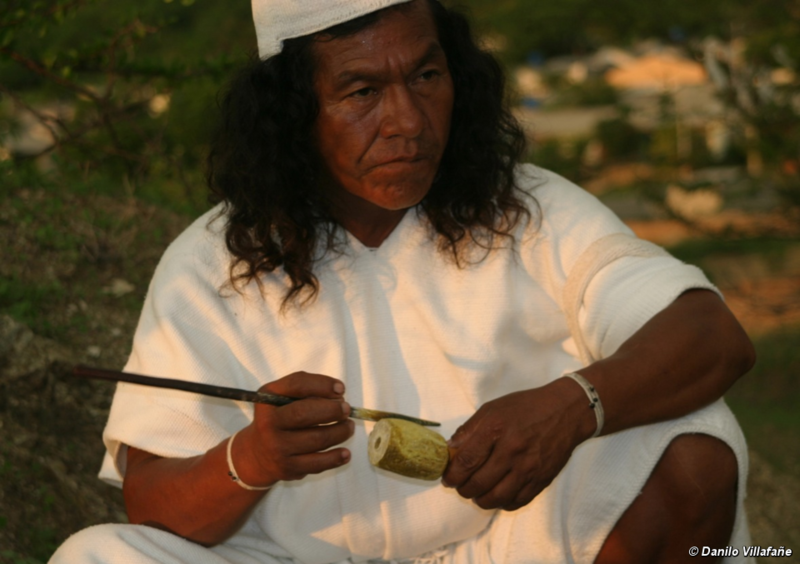 The Arhuaco People for opening their homes, land and hearts. The People of Ikarwa who hosted over 400 people in their beautiful community. The participants of “the Dawn of a New Time,” from around the world, for allowing the filming of this event. The indigenous Elders and spiritual leaders who traveled from around the world for this gathering. Much Gratitude to the kitchen staff at the Dawn of a New Time for their hard work and delicious food. The donations of the Participants and others raised $19,000.00 for the Tayrona Indigenous Council. This money will be invested to the cultural and spiritual permanence of the Arhuaco and Wiwa People. Foundation for Global Humanity is pleased to present this interview with the Arhuaco Mamos on the last day of”The Dawn of a New Time” gathering. The gathering took place near Valledupar, Colombia in August of 2011. 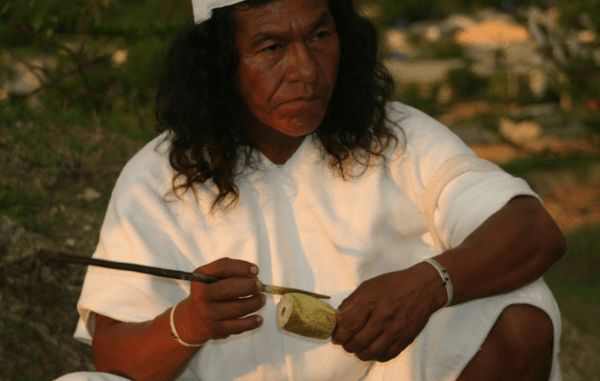 The gathering included over 400 participants from around the world to learn about the ways of the Arhuaco people. 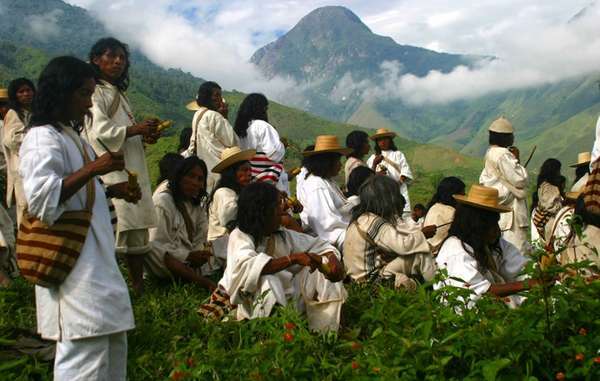 For additional information or to provide support (donations) that go directly to the Arhuaco people, contact the Tayrona Indigenous Confederation, official representatives of the Arhuaco people, at resguardoarhuaco@hotmail.com or connabusimake@hotmail.com. This was a short demo we created to go to film festival market…not anymore…we are now an Exp Film and tour…out of the box filmmaking. Blessed txs to Rebecca Somers for letting us use UN footage, the Mamos, Hopis, and all the elders of Condor & Eagle nations. This video will not be sold…just for entertainment and a Propehcy in motion…. PARTE 5 – Entrevistas abuelitos / entrevistas con Barabara Three Crow, elaboracion del docuemento “MENSAJE DE LOS PUEBLOS ORIGINARIOS DE AMÉRICA DESDE LA COCHA, GUAMUÉS, PASTO, NARIÑO”. Durante el mes de Augosto del 2009 se llevo acabo en Pasto , Narino, Colombia, el primer festival Tiempo de Florecer, encuentro de culturas andinas. El enfoque principal de este festival fueron los conocimientos de los abuelitos y abuelitas indigenas que fueron invitados de Sur , centro y norte america. El festival duro aproximadamente una semana, tiempo durante el cual hubo conferencias, mesas de trabajo, presentaciones, muestras artisticas y finalmente un encuentro formal entre los abuelit@s donde tuvieron la oportunidad de redacar un manifiesto que se entrego a la UN y el gobierno de Narino para posteriormente ser entregado a los dirigentes del mundo. Hice un documental editado de + o – 2 horas del evento, lo subi aqui a vimeo en 5 partes, esta es la quinta parte. PART 5 – Interviews grandparents / Three interviews with Barbara Crow, elaboration of docuemento “MESSAGE OF THE NATIVE PEOPLES OF AMERICA FROM COCHA, Guamués, Pasto, Narino”. During 2009 Augosto place in Pasto, Narino, Colombia, the first festival time blooming meeting we took Andean cultures. The main focus of this festival were the knowledge of indigenous grannies and grandpas who were invited from South, Central and North America. Hard festival about a week, during which time there were lectures, workshops, performances, art exhibitions and finally a formal meeting between the abuelit @ s where they had the opportunity to redacar a manifesto that was delivered to the UN and the government of Narino later be delivered to world leaders. I made a documentary edited from + or – 2 hours of the event, which went up here to vimeo in 5 parts, this is the fifth. Wade Davis was named by the NGS as one of the Explorers for the Millennium, he has been described as “a rare combination of scientist, scholar, poet and passionate defender of all of life’s diversity.” In recent years his work has taken him to East Africa, Borneo, Nepal, Peru, Polynesia, Tibet, Mali, Benin, Togo, New Guinea, Australia, Colombia, Vanuatu, Mongolia and the high Arctic of Nunuvut and Greenland. Ancient Voices, Modern World: Acclaimed anthropologist Wade Davis journeys into hidden worlds to find cultures that have preserved their ways of life in the face of modern society. Acclaimed anthropologist and explorer Wade Davis travels to the Central Asian steppes of Mongolia to meet descendents of Genghis Khan. These people are remnants of an ancient nomadic horse culture that thrived in the region’s harsh conditions for more than 2,000 years. National Geographic joins Wade Davis on a journey deep into the Australian outback to document the disappearing cultures of Australia’s Aborigines, thought to be one of the oldest groups of peoples on earth. After losing clan members to disease, war, and famine–as well as battling enforced relocations–small Aboriginal clans must fight to keep traditions alive for the next generation. National Geographic ventures into the rain forest with Wade Davis for an up-close look at the Barasana River people, a group believed to be descendents of the legendary “lost” Amazonians. Davis embarks on a symbolic journey that will honour the group’s ancestors and witnesses the rituals that demonstrate respect for this tropical landscape. Acclaimed anthropologist and explorer Wade Davis makes a remarkable journey into the heart of war-torn Colombia to visit one of the indigenous groups that call themselves the Elder Brothers. These extraordinary people claim to be the last descendants of a once-great civilization, the Tairona, and to speak with their voice. Could they be the last window we have on the great high civilizations of the ancient Americas? Traditional carer of Uluru in Central Australia speaks about his support of the Kogi Indians of Colombia’s new film ALUNA.